It isn’t so hard to eat locally during the winter, that is, if you plan ahead and put food by while it is in season. Canning tomatoes, making jellies, jams and preserves, freezing marinara sauce, pesto and making and canning salsa, and drying and freezing herbs all help families eat the bounty of a local summer while the winter winds blow. Root cellaring, which has become popular again, allows us to eat local potatoes, onions, garlic, squash, pumpkins, turnips, apples and other root vegetables all through the cold season. But by early spring, most of the stored goodies are gone, and I find myself relying on non-local foods more often, while waiting for the spring-time delicacies to sprout here in Athens County. In March, the blandishments of the Kroger produce aisle work their magic and I find myself buying asparagus from California, a month before it is due to be harvested here in Ohio. And fresh basil, even though there is fresh cilantro I just bought from a local farmer. Sometimes, I am a bad locavore. Oh, well. No one should expect to be perfect–just do the best you can for yourself and your family with what you have. The truth is–the use I put that asparagus and basil to is a good one–most of the other ingredients, except for the penne, lemon juice, Aleppo pepper, olive oil, and the onions, came from local sources. The chicken, chevre, garlic and fresh shiitake were all locally grown and produced, and the chicken stock was made in my kitchen from local chickens and vegetables and frozen months ago. So I think of this dish as half-local. Which is not bad for Ohio in March. 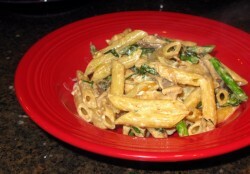 Now, this recipe could very easily be converted to a vegetarian pasta dish, and with no real loss of flavor. In fact, I think that I would prefer it without the chicken, but Zak and Kat really wanted chicken for dinner last night, so in it went. But, to convert it to a vegetarian pasta, just use tomato-free vegetable broth instead of chicken stock and leave out the chicken. When you saute the mushrooms, toss them in a bit of flour, just as I instruct you to do with the chicken. The flour serves the purpose with the chicken and giving a dry surface for cooking that will lead to a nicely browned crust, and with mushrooms, it does a little bit of the same thing. But its secondary purpose, that of thickening the sauce, and adding a brown flavor to the sauce, is accomplished just as easily with the mushroom version as it is with the chicken. As for the fresh basil–you could use another fresh herb in its place, but I am desperately fond of the combination of sweet asparagus and sweet basil–they are so lush when combined together–especially when paired with tart, fresh chevre. At any rate, here is last night’s dinner, which Kat, Zak and I all loved, and which will probably appear again, in various incarnations, over the next month or so as the local asparagus comes into season. Heat the olive oil in a heavy-bottomed, deep skillet or Dutch oven. Add the onions, and sprinkle with the salt. Cook, stirring, until the onions are a light golden brown. Add the mushrooms, and cook, stirring, until the onions turn a deeper gold color and the mushrooms shrink and brown a bit themselves. Deglaze the pan with a little bit of the stock or broth–not all of it–you will need it later. Maybe a couple of tablespoons at most. Toss the chicken with the flour until it is well coated. Add it to the pan with the mushrooms and onions and cook, stirring until it is mostly brown and white with very little pink showing. Add the garlic and the Aleppo pepper or black pepper, and cook, stirring, until there is no pink showing, but the chicken is not quite done. Deglaze the browned bits of flour off the bottom of the pan with most of the rest of the broth or stock–leave some behind for thinning the sauce if necessary–just a tablespoon or two should do it– by adding it bit by bit and scraping up the flour and chicken bits. Turn the heat down on the pan to a simmer and cook until the chicken is done and a thick sauce clings to the onion, mushroom and chicken pieces, with very little left in the pan. Drain the pasta and add to the pan. 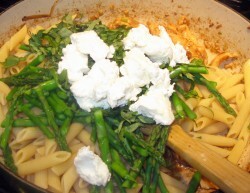 Before stirring it in, add the asparagus pieces, the basil and the chevre. Turn off the heat, and stir well–two wooden spoons help this process along–until the pasta is coated with the sauce, and everything is mixed together. If it is too thick and glumpy, add a bit of the reserved stock–a tablespoon or two should suffice and keep stirring. Add the lemon juice and the salt to taste and toss until well combined. Serve in warmed bowls, and garnish with reserved whole basil leaves if you remember them, which I didn’t. This dish will serve three to four adults and one hungry toddler easily. If you want, you can add more pasta, more chicken or more of everything to stretch the dish farther. Wow that is a super delicious pasta meal. It’s darn good for March in Ohio. I am waiting, somewhat impatiently, for the local farmer’s market in Hartville to get into swing, as well as the opportunity to start my own backyard garden once more. I do believe I’m going to try to can my own salsa and tomato sauce this year – I wish I could can zucchini, but I guess I’ll settle for freezing a ton of zucchini bread again. What about drying the zukes? Dry 1/4″ slices in a very low oven or in a dehydrator. I leave mine a bit softer than leathery and store in the freezer, as they’re not dry enough to last a winter otherwise. I use them in the winter in stews and pot pies, but you can eat them as snacks as well. Another idea is shreds: grate zukes on large holes of a box grater. Wrap in a cloth towel and squeeze HARD. Then twist the towel to squeeze more. (You can pour the juice on the garden, or drink it if you’re a bit crazy.) You now have dry shreds. I add them to sauteed veggies & mashed root veggies, I bet they’d be tasty tossed in flour or cornstarch and deepfried but since I don’t like the mess I don’t deepfry. I haven’t tried freezing them but it should work just fine. I wonder … how long would the shreds last in a vacuum-sealed bag? How long would the mostly-dehydrated slices last in a vacuum-sealed bag? Maybe that would let me save on freezer space. Finally, of course, find out which of your neighbors leave their car doors unlocked. I just cut our first asparagus this afternoon and cooked it up for supper—served it alongside a chicken and rice goulashy-type dish. Spring is here! I made this for dinner tonight. It was fantastic! The only change I made was deglazing the pan with white wine after cooking the chicken. Really really good meal.